In 2014, sixth class worked on an anti litter visual arts project with an artist called Karen Webster. Karen works with “Primary colours”, an arts programme for national schools for Sligo Arts Service. Karen has worked in the school on previous visual arts projects, including the Local Area Mural. Karen had many discussions with the class about litter. She asked questions such as: Where is litter commonly found? Why do some people litter? What can we all do to reduce the amount of waste in both our homes and at school? Karen and the class teacher, Serena Doohan, then taught the children about the concept of recycling. We looked at recycling symbols, what items can be recycled and which bins they go in. 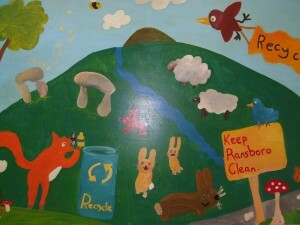 To begin the project the children were encouraged to sketch pictures based on an anti litter campaign in our local area. Karen then explained to the pupils how they would be selecting different images from all of the pictures to go onto the three murals. The pupils were then divided into groups to paint the three murals. Images on the murals include local landmarks such as Strandhill beach, the roundabout outside the school, the local church and Carrowmore tombs. The main theme that runs throughout the three murals is the concept of recycling and keeping our local area clean and tidy. The three murals are now on display in the school; one mural is outside in the enclosed Glen area and the two others are displayed in the school corridor.